Late one night last week, while John was getting ready for bed, I was scouring Pinterest on my iPhone. Some days, I barely pin anything at all on Pinterest, and others, I’m an absolute maniac, re-pinning everything I see. Cute puppies, strange tattoos, 18-layer cakes – you name it. This particular night, I found something that really caught my eye, so much so that I was determined to make it the very next morning. The recipe I’m sharing is inspired by the one I found, which was featured on Babble. Kathy’s version was raw and mine’s not, so if you’re on a raw diet, by all means, stick with her version. 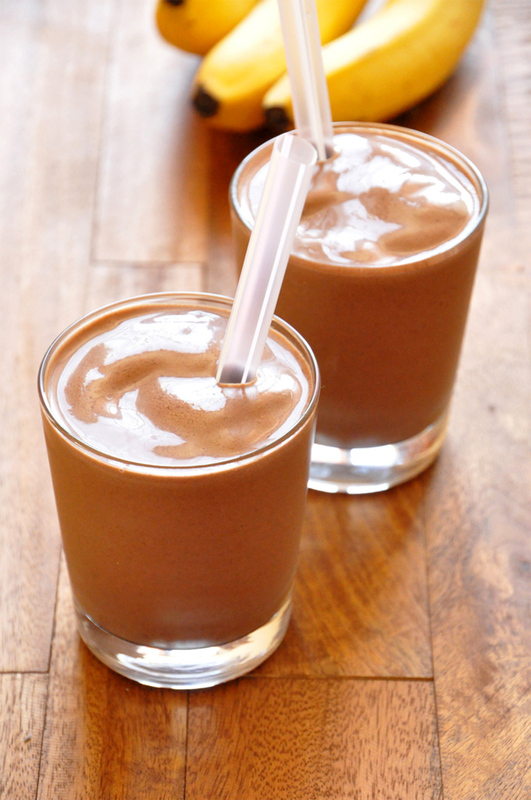 But for those of you not on a raw diet, this is probably about the creamiest, dreamiest chocolate shake you’ll have that just happens to be vegan and totally healthy enough to call breakfast. Since making this for the first time a week or so back, it’s been my go-to breakfast nearly every morning – so freaking delicious. 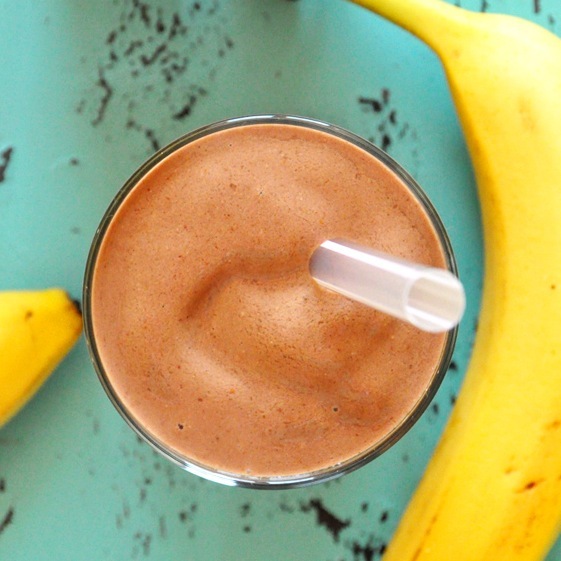 You can taste the bananas only slightly, so if they’re not your thing, try it anyway. 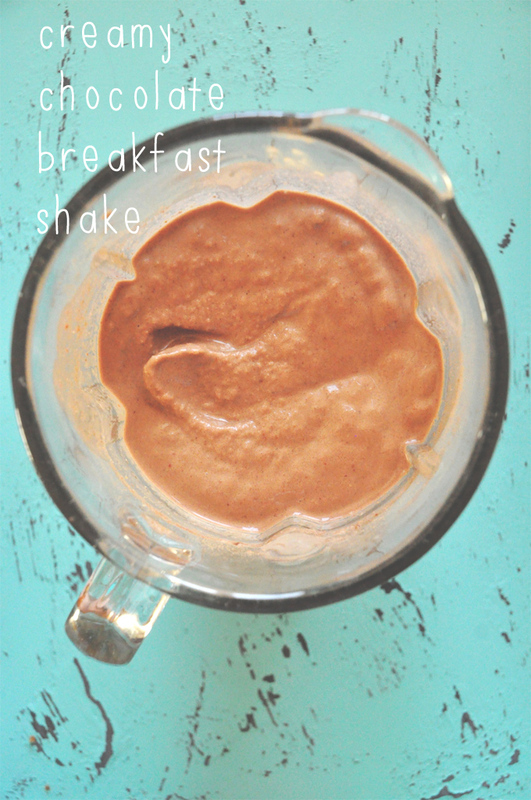 I made this without the almond butter or the spinach and used cacao powder instead of cocoa. It’s awesome! However, I’ve started a new job and get up earlier, so for when I’m in a hurry I now buy frozen fruit blends and simply use those with almond milk, flaxseed, and cacao powder. Both are very easy! Delicious! Used dutch cocoa, which made it even more chocolatey. And bananas weren’t frozen yet, so added a bit more ice. So good, thanks! I have found that you can use pear in place of banana for a base. It’s very creamy and usually sweet (unless you have green pears). I cut up pears and put them in the freezer much like bananas and it works very well. Just a suggestion for those avoiding bananas. I have been trying to find a smoothie recipe I actually like with my pickyness in texture, and taste that was vegan and healthy for a long time, so glad I found this recipe. I really enjoyed this smoothie! This is one of my fave smoothies ever! My kids love it too! My son is allergic to nuts so we use sunflower seed butter and normal milk. Also I like to use honey for the sweetener. Sooooooo good! Omg i made this 3 days in a row now lol! Soooo good! I added dates as a sweetener. Is the 312 calories for 2 servings which make it 156 calorie for each? We’re glad you enjoyed it, Honey! 312 calories is for 1 serving of 2. This was so good! I made it for my daughter and she was all smiles! Very good. I only make one serving (mostly, see below) at a time myself. – Sometimes I still use a 1/3 cup berries. Other times I use less. – I use skim milk (not vegan) or 1/2 milk and 1/2 tea. – Sometimes I add half a carrot or half a zucchini. This is when I use less berries. It’s just too much food otherwise. – Another optional ingredient is some vanilla extract. Hi Dana, I saw that this recipe has a Salted Almond Butter recipe linked in the notes. When I clicked on that, it brought me to a different recipe and I couldn’t find the almond butter recipe. Let me know if you have a Almond butter recipe! Thanks! I couldn’t find the Salted Almond Butter recipe either, the link took me to other recipes as well. Same here, it takes me to the spirulina smoothie recipe. This is definitely a favorite! And kids love it too. I prefer using frozen blueberries over strawberries. And I don’t need to add any sweetener. Thank you for this and your other yummy recipes! I use kale in my smoothies. Easy to keep a bag of chopped kale handy to add in your smothie. So I made a spin off of this recipe and it worked great this sort of a last resort when you dont have a lot of ingredients. So frozen strawberry, cocoa powder, oats, chia seeds , almond milk and mac ca powder . Its sort of a creamy ice cream and is delicious. I use pure coconut water instead of milk and throw in walnuts or almonds……sometimes add MACA….no sweetner..to me already sweet….. Delicious and you’re right that the bananas is no overpowering at all. I hadn’t had any smoothies with banana and chocolate in it that I liked before this one. I think the almond butter rounds out the flavors so it’s not a bananarama. Thanks for another great recipe! Delicious! I subbed some stuff due to what I had in the pantry and added a teaspoon of diatomaceous earth (a trick my friend suggested, to hide the chalky texture). I could drink these every morning – maybe I will! This smoothie is amazing and has been in our smoothie rotation for a few months. My husband and three year old both love it, too. Still tastes good with fresh bananas but the texture will not be the same. I made this smoothie for an after dinner treat, and it was delicious! I followed the recipe pretty much, except I used 1 cup 2% milk and 1/2 cup fat-free Greek yogurt. I did not add extra sweetener or spinach. My husband even loved it! I make this every morning. Mine is 1 banana (trying to lose weight so feel like 2 bananas are too much), spinach, mixed berries, Chia seeds, 1 heaping tbsp cocoa, almond butter, 1/2 cup uncooked oats, unsweetened almond milk. The best! Hi Dana! I love your blog. It gave me the courage to go vegan!! I had a question about this recipe. It says that it serves two, and then the serving size is two shakes. Does that mean it makes four shakes or two? I like fruity flavored chocolate and have made this recipe many times. YUM! Thank you! However, sometimes I just want my chocolate smoothie to just taste like chocolate (or chocolate and PB) without the fruity flavors of banana or mango and without sacrificing the satisfying creamy texture they add. I discovered that adding a few chunks of steamed and cooled sweet potato to a chocolate or mocha flavored smoothie is quite successful at adding sweetness, as well as the desired creamy smoothie texture without sacrificing flavor. It’s truly delicious. Try making this recipe with steamed sweet potato (no butter or salt ;p) in place of the banana and blueberries and let me know what you think. I’m on the lookout for more healthy and tasty smoothie ideas, so keep’m comin’! Made it this morning! Delicious!! Would never think of using cocoa powder. Easy and quick to make too. I love you guys! Totally addicted to the “3 ingredient cheesecakes”. I look here first for new stuff to yum. I wish you were all vegan-but I’ll take what I can get- you rock. This smoothie is delicious! I added a few dates for a bit more sweetness and since I didn’t have almond butter I used peanut butter. Nonetheless, this is now one of my top 5 favorite smoothies. Thank you for the recipe. Wow! This is really good! I don’t care for bananas in smoothies so I doubled the fruit and only put in one frozen banana. I used natural peanut butter (all that I had on hand) and skipped the ice (blender is too small to fit all the deliciousness!) and it turned out FANTASTIC. Will definitely save for the future! We love this recipe, it’s perfect and the spinach is hidden without tasting it, thanks so much!!! Has anyone tried cacao powder for the cocoa? I love this shake! I have it an awful lot. I hope you don’t mind that I have used this recipe in one of my blog posts. I have referenced you and left your website address, but do say if you want me to remove the post. I was desperate to try this but knew I only had 3/4 of one banana.I used everything else except the other banana and loved it!I also used a mix of spinach and kale.Can’t wait to try it with two bananas! Is it essential to have vanilla almond milk or can regular almond milk be used? I made this as close to your version as I possibly could. I’m kind of new to shakes so I’m about OD’d on the ‘heaping’ tbsp’s of cocoa. Lol! Which by the way seem to bring out the 2 tbsp’s of PB2 that I used instead of almond butter. I managed to get it down but I most definitely will have to play with it to make it (for lack of a better word) more customized. I’m not a huge chocolate fan but your pics looked awesome & mine came out real grainy. I’m also working with an individual serving smoothie blender & not a traditional sized one. My oh my! Wish me luck! Lovely! Glad you liked it, Alexis! This is a super fancy version of my milk shake. 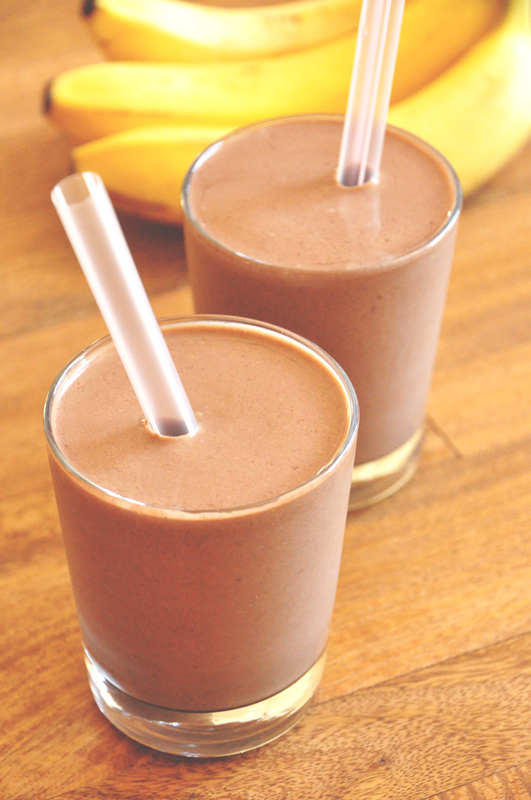 Just frozen bananas, cocoa powder and milk, usually coconut. Yum! I make a similar kind with tofu but I think I will try your version without, looks delicious! My husband and I are a little bit obsessed with these breakfast shakes. Thanks so much for the recipe! It’s been a great pregnancy staple for me. I would like to try this but can’t eat almonds. Is there any alternative to use that is tree-nut free? Try adding in some cooked, pureed (in blender), and cooled oatmeal. After pureeing and cooling, oatmeal takes on a consistency that’s a bit like flax/water, and a bit like heavy cream. Ie it binds well and thickens well. 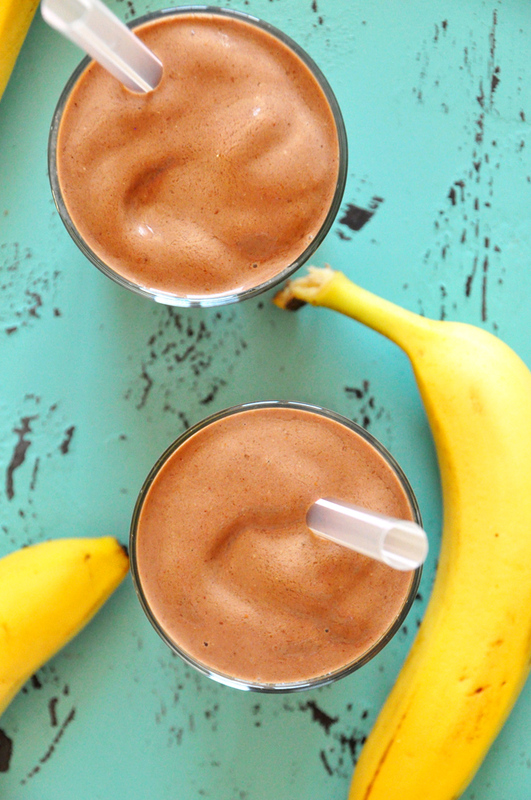 It makes for a very creamy consistency to any smoothie. Try substituting chocolate protien powder for the cocoa and sunflower sead butter for the almond butter plus a little bit of vanilla protien powder w no banana … Tastes similar to pea it butter mood at Jamba Juice and makes a great high protien shake . I have learned this from a class call BEST classes in AZ . It’s a series of free seminars to help change the face of America . Anyway the guy who started them is named Richard and you c. Get on his email , each ofhia recipes I have tryed are killer good ! Your smoothly sounded very tummy and similar ! His makes.a Good workout shake ! Thanks for sharring ! He introduces me to sunflower seed butter … It’s amazing ! Woke up 5 minutes early this morning to blend up this deliciousness and I’m not regretting it!! Such a good idea. I think next time I’ll use more berries and less banana per my taste bud’s liking. This will go in my breakfast (or snack) arsenal. Thank you Friend! Lovely! Yeah, it’s one of my favorite smoothies. seriously tastes like a shake! I noticed in the recipe for the CREAMY CHOCOLATE BREAKFAST SHAKE that the recipe for the salty almond butter was not in that recipe, or was I missing something? I would greatly appreciate it if you would post it or send it to me? Thank you. Sorry about that Alice! Here it is! I have been making these for some time now! LOVE them! Mine are very green as I use quite a bit of spinach!!! I love subbing in different frozen fruits, whatever I might have on hand. I also like to put in a dash of cinnamon!!! This looks really yummy. My granddaughter is coming to visit for Thanksgiving weekend and is a smoothie fan. I would love to make this for her but she has a nut allergy. Any suggestions on a substitute for the almond butter? Peanut butter it is! Thanks. The reason people have allergies to “peanuts” because they are a legume. They are not a nut. 9 times out of ten that is the only “nut” they are allergic to. Peanuts turn rancid 2 hours after you pick them. They also have a very high mold count. ? Sun butter works well too! I already have most of the ingredients on hand, so I see myself making it in the very near future !